People consider them to be so cute and so charming that they even had their own reality television show. In a recent study out of Spain, however, it has been discovered that Meerkats are actually the most murderous of Earth’s mammals. The little cat like creatures are extremely social creatures and live in groups known as mobs. That seems to be the proper terminology for their groups according to this research study. 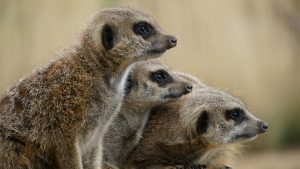 A group of scientists from Spain’s Granada University studied 1,024 different species of mammal and discovered that there is a higher rate of murder among Meerkats than among any other mammal, including humans. These vicious carnivores can live in mobs of up to 50 Meerkats and, according to the research, 20% of all Meerkat deaths are the result of premeditated murder. There has been research done on Meerkats in the past. A 2006 study done at London’s University of Cambridge found that the females are extremely dominant and the most likely to be murderers. The mobs are grouped in an hierarchy that simply can’t be breached or altered. Quite often a female will murder the offspring of other Meerkat females if she considers that female to be a threat to her standing in the mob. It also depends upon resources. If they are scarce, females will not balk at murdering as many pups as possible to balance out the access to resources. The research team notes that they hoped their research will help them to better understand human nature. They point out that from about 5,000 to 500 years ago, the murder rate for humans consistently hovered in the 15%-30% range. The murderous Meerkats are even more violent than the Brown Bear population whose murder rate was measured at 9.7%. Other species that ranked near the top of the murder scale were the Lion, Grey Wolf, and the Mongoose. Others included the New Zealand Sea Lion, the Black Lemur and the Blue Monkey. The research was published this week in the journal, Nature.